Your Visual Strategy is the face of your blog and business. Once you have a blog or website you need to think about your Visual Strategy. If you have a business, then it’s even better to settle on your Visual Strategy as you build your site or even before! This can be done with the help of a Visual Strategist, a Brand Designer, or Graphic Designer. A Visual Strategy is the perfect combination of branded elements; logo, colors, fonts, images and graphics that represent your brand not only on your website but also your blog and further on to Social Media. Every blog and website is different, that is why yours too needs its own Visual Strategy; your personal combination of branding and personality that will make your brand memorable and easily accessible. Your content will never get lost in Social Media. Social Media and the internet in general are highly visual spaces. Almost everyone when reading something on their screen, will skim it first to see if it’s worth their precious time. If there is only text they will get bored pretty quickly. 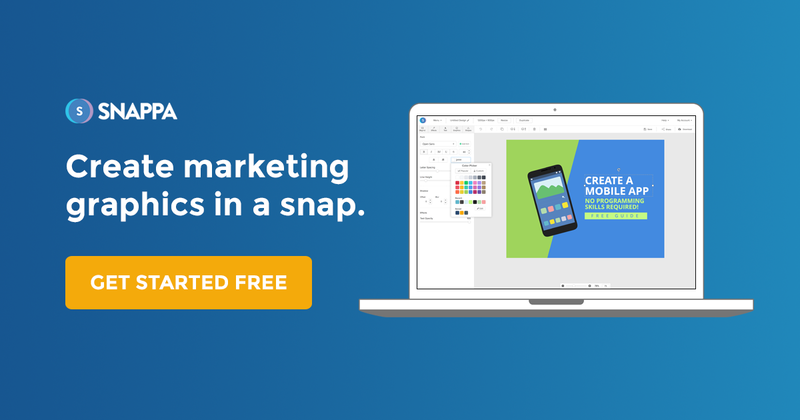 You can use headers and bullet lists but nothing beats an infographic, a good photo, a great title graphic, a collage or an awesome Pinnable! In this article we will concentrate specifically on your images and graphics. If you want to learn more about your Branding, you can download my free “Brand your Blog” e-book and create your own amazing brand. Images are important because they are the face of your blog in the vast Social Media universe. It is through your images and branded graphics that people will find your blog posts and your awesome content. Your images and graphics are shared on Facebook, on Twitter, on Pinterest even on Linkedin and maybe even Reddit and other places you might never even have heard about. What are Branded Graphics and Images? The visuals included in your blog posts will make their way to Social Media when you share and when your readers share. They will also make it to Google Search when your SEO is well done. More on that below. The greatest and most important rule when including images and graphics in your blog posts is your branding. When you brand your visuals, they will be instantly recognizable and will make a greater impact. There are different levels of branding for all the image content in your blog. The two most important images that need to be branded are your Blog Post Titles and your Pinnable graphics. Complementary visuals should also be branded but in a lower capacity. Photographs are better with watermarks. These are all visuals that are shared on Social Media and when they leave your blog they should take your branding with them! Branded graphics are what tie the content of your blog posts with your brand. At first sight, your readers should know that these images or graphics belong to you. When readers see them on Social Media outside of your blog, they will know that after clicking, they will be redirected to your article. Branded graphics and images create a memorable connection with your readers and there’s no better experience than real connections. What has to be included in a Branded Graphic or Image? Your font and color scheme should be present in every graphic you create! Extra things you can use in your branded graphics: You aren’t limited to using photographs or backgrounds when creating your branded graphics. Try using icons, or illustrations. If you are really serious about your business you can even get a photographer to create your own set of photographers that nobody will have apart from you. Illustrators can also create great imagery for your graphics if that fits your style. A watermark is your logo or your name, placed on your photographs with a transparency so that unethical people won’t steal your work. Also to make sure that when someone finds your photo in Google Images, it is obviously owned by you. Some photographers place a very large transparent watermark in the center of the image so that it cannot be cropped out. For blog posts, you can just put the watermark on a bottom corner, unless you yourself are a photographer and need to protect your work. Placing a watermark can be done in any desktop or online editor. Programs like Photoshop can watermark many photos at once by creating an action. The watermarked cheetah photo on the right is from one of my clients. I made her logo and she uses it to protect her photos on her blog Los Gringos Locos. The desk image is an example stock photo, they use watermarks to protect their photos from theft as well. When you buy the photo, you receive a copy without the watermark. ​Where can you find good quality photography and backgrounds? If you are not a very good photographer and don’t know where to find good photographs for your visuals, please go ahead and read this article about great websites to download free and inexpensive stock photography for using in your blog. If you prefer to use graphic backgrounds instead of photographs, the article also tells you where to go to get some really nice backgrounds and online programs where you can create your own. Once you have your photographs or backgrounds or creative assets set up to create your graphics, you can create them in one of many online or desktop editors available to you through the magic of the internet. Don’t use stock photography “out of the box”, customize it to fit your brand with overlays, and strategic cropping. Stock photography can be detrimental if not used right. Just downloading and using without editing is not good enough. Start by picking photos that match your brand but aren't overused. After that, make them match your brand. 😃 For more tips like these every day, join tje Rock your Visuals Facebook Group and learn to make better graphics. Just click the link in my profile. Is there a way to streamline the branded graphic creation process? Creating branded graphics takes time. Every blog post needs a Blog Post Title and a Pinnable graphic at least. Adding additional complementary graphics and images is up to you but the two I mentioned are the most important and should never be missing from every blog post. There is a way to streamline the process, by using templates. A template can be created quite easily on Canva or your favorite editor, but if you don’t have time to do this, you can get a pack of the Orana Creative Personalized Blog Graphics that will save you time and also keep this blog afloat cause we all have to pay stuff to keep working! What if your blog doesn’t have it’s own Domain? I suggest that you fix this straight away. There is no better way to feel like your blog matters and that you take it seriously than by getting your own domain for it. Not only that, when you share your blog url it looks much better as it’s own domain than it having .wordpress or .blogspot behind it. You can buy your own domain through BlueHost and get some email boxes along with it. Getting your own domain is not as expensive as you might think. I held back for a long time thinking that I couldn’t afford it until I took the time to really find out the domain deals and it really is quite affordable. You should go for it as soon as possible. Join me on Thursday July 18th, 2017 for a Twitter Chat with Viral Content Bee.